ITV viewers got a sneak preview of John Lewis' Christmas ad last night when a teaser aired with the hashtag #sleepingbear, although some viewers believe Coca-Cola was behind the ad. The five-second ad aired on ITV yesterday during shows such as ‘Agatha Christie's Poirot’ and showed an animated sleeping bear. 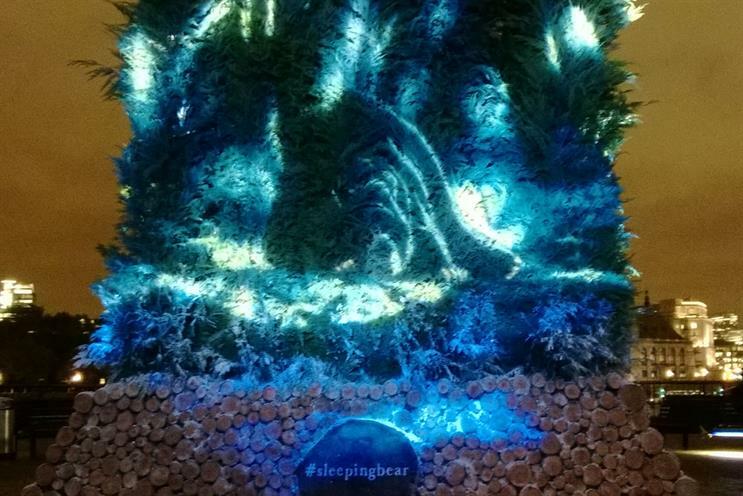 The teaser included the hashtag #sleepingbear and promoted the first airing of the ad on Saturday. To accompany the short TV ads John Lewis has also developed an installation on London’s South Bank (picture above). The agency behind John Lewis' advertising is Adam & Eve/DDB, which created the lauded "the journey" spot last year and "the long wait" in 2011. The retailer's media agency is Manning Gottlieb OMD. On Twitter people were split on whether the teaser was promoting the Christmas ad from John Lewis, or the one from Coca-Cola. The full-length John Lewis ad will air on the TV for the first time on Saturday (7 November).